You are currently browsing the archives for the North Yorkshire Attractions category. 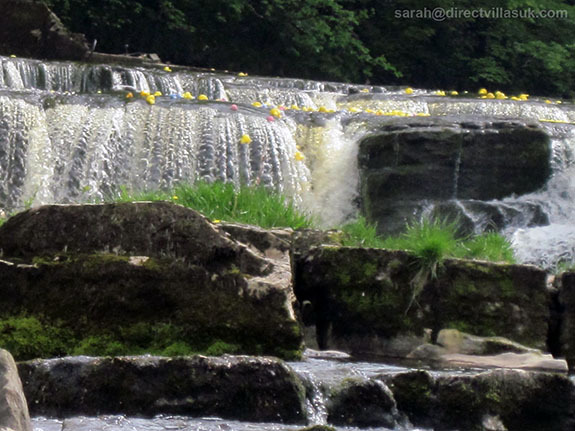 Going Quackers in Richmond North Yorkshire. Did you know that Le Tour de France is not the only big race to hit Swaledale this Summer? 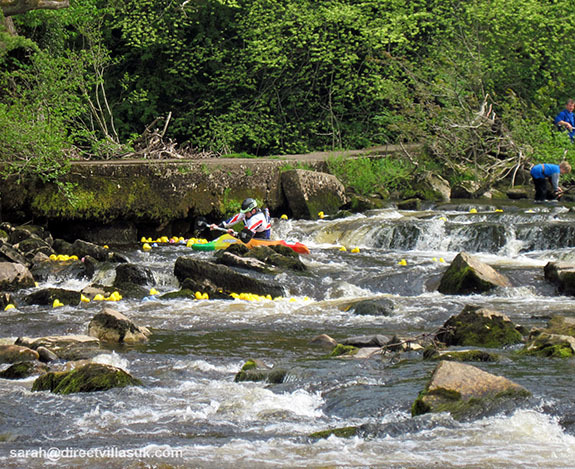 Every year Richmond in North Yorkshire hosts an annual charity Duck Race on the May Day Bank Holiday. 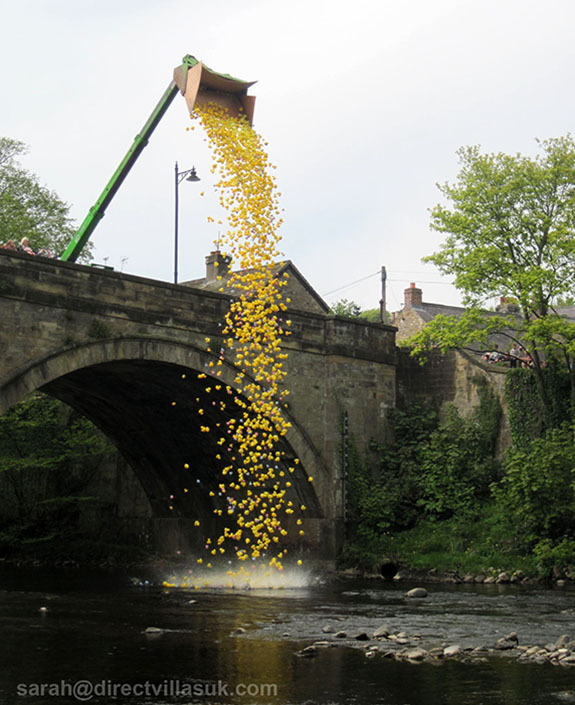 This year was no exception and visitors to the town might have been surprised to see around 2000 plastic ducks bobbing along The river Swale on Monday 6th May. The race is organised by Richmond Duck Club helping to raise money for young people in the town. A set of sports shirts for a local youth team, equipment for special needs students or the trophies awarded every June to the local Young Sportsperson of the Year – just some of the projects the funds have been used towards. The Grand Duck Race is the main fundraising event of the club with money raised from tickets sales – each ticket with a corresponding duck. There is a price for first, second and third duck past the finish line and also a consolation price for the last duck home! The race starts at The Green Bridge where a JCB launches the ducks from on high into the water below where they stream down to Richmond falls and the finish line on The Batts near Station Bridge. Some of the ducks need a helping hand and there are plenty of ‘Duck Wranglers’ in canoes and wading along the banks a large sticks to make sure no bird gets left behind. Of course the public (and the odd pet dog) are often keen to nudge any stranded ducks along their way in the hope that their duck will be first past the line. The pace usually hots up in once the ducks hit the falls and you’ll often see a few wet spectators who have ventured in too far too save a duck or try and spot their number. Yes it is possible . 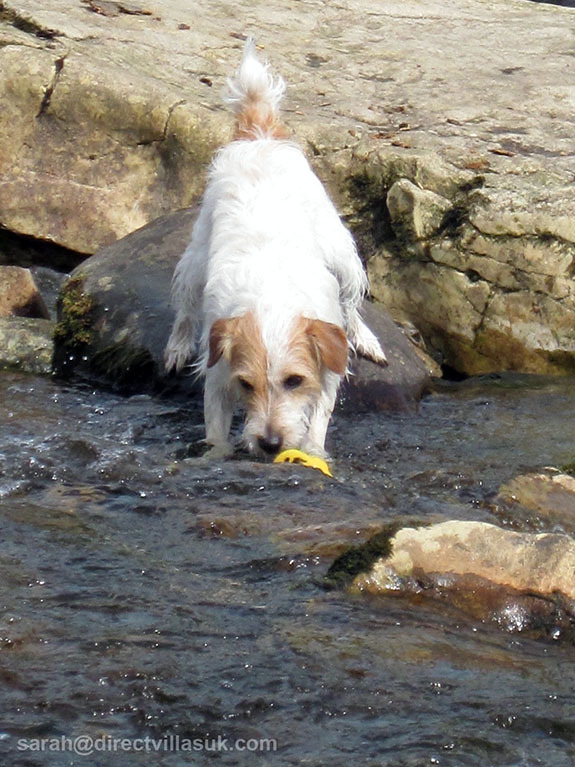 . . we have found our own duck lodged on the rocks in previous races! Unfortunately we’ve not had the same luck with a winner yet! This year there was a clear winner which romped past the finish line a good five minutes ahead of the competition. The race for second and third was a little closer with one blue and one yellow contender fighting for position. I am afraid that once again, none of these first three belonged to me or my family . . . . . but I am still waiting to hear about last one home if anyone has the number? As we wandered off in search of refreshments at The Station, we did spot one lone duck making a break for freedom and floating on under The Station Bridge. It had obviously slipped through the duck collectors at the finishing net. So spare a thought for next year’s organisers . . . . whose job is it to check that all the relevant numbers are present for the next race in 2015? Just one request – make sure mine is in the running please! Own your own holiday home in Richmond or The Dales? To find out more about how to feature your own property on www.directholidaycottages.com, contact Sarah or Tracy today. Will you be there when Le Tour hits the Yorkshire Dales?